Remember how I was planning to use all these…. ….to dress up the one (yes, just one) window in my bedroom? Well, it’s all finally up and I’m really happy with how it turned out….eventually. Sure, there may have been one or two ‘measure once, drill twice’ incidents and about three hours spent trying to work out how that darn bamboo blind was actually gonna stay up there and look half decent though it all came together in the end. As I’ve mentioned previously, we needed a blackout treatment and nothing really beats these guys for effectiveness and affordability. Shame about the looks though. Now, I could very well have left my window treatment at that. Because of where the roller blind is mounted it blends in pretty seamlessly, however, I had a vision (and how hard could it be to make a bamboo blind that’s supposed to be attached to a window frame into a valancey thingo that hangs off a pole? Well, not hard at all after three hours of exhausting the 101 best possible ways to do it!). I’ll spare you all the trials and tribulations and just say that in the end I decided to cut the blind straight down the middle horizontally. I then removed the string and eyelets from the lower section and re-tied the binding thread (which sounds time-consuming though was relatively quick and easy) so I had a plain piece of woven matchstick bamboo. I know it may seem crazy cutting up a completely perfect blind though I had no intention of actually ever using it as a blind. I did initially check out the garden section of the hardware store for some type of bamboo screening I could use instead though couldn’t find what I wanted – plus screening is way more expensive than a blind anyway. I draped and wrapped my piece of bamboo around a cheap black curtain rod, playing around with a few different looks until I found one I liked (my blind is pretty evenly weighted though if you try this and find yours keeps slipping use some strong tape or pliable wire to keep it in place). Next, I simply hung it up on some brackets to conceal the roller blind. I love the rustic, natural feel it adds to the window. I needed my bamboo valance to sit out over the roller blind though behind the curtains so used mid-length mounting brackets. So, there you have it. A slightly crazy-lady way to create an affordable and attractive blackout solution for your window. You’re a genius! I’d be terrified of cutting the blind and mucking it up completely. looks great, kris! i love the crisp white against the more rustic brown… it will suit the rest of the bedroom perfectly. I may just have to steal your idea – we would like a black-out window as well in our master bedroom. The makeover is happening this weekend! You should stop by next week and see what we did with it :) Thanks for sharing :) Have a great weekend! Fabulous idea hiding the roller shade with the bamboo! Love this solution! Does the white roller shade really block out that much light? I’m in the midst of finding a window solution for my own bedroom… I wouldn’t have thought to layer 3 things, but it looks really great! And I love the white.. The wicker blinds add a nice finishing touch as well! Such a clever and imaginative lady. It looks great!! I love the way you layered the window! Clever. It looks so refreshing with depth. I love it!! It rally gives the window some interest and life! I never would have thought to cut them in half like that! Very clever! omg, I’m sweating just reading this! I think I’m adding you to my home page fav. reads. one more thing…it’s insane how similar we are, and not just our blog names. we’ve got great taste girlfriend! The bamboo adds the perfect amount of texture and interest. The finished product looks great! Very clever DIY solution. I agree about a blackout shade being a necessity in a bedroom. Jane F.
Hi Kristine, The finished window looks wonderful! How creative you are. This is so fantastic! Really creative way to cover up that plan, ugly roller! What a great way to add texture and hide the roller shade. Love how fresh it looks. Wow, that looks great. I wouldn’t hve thought of the bamboo valance! Well you certianly get my vote for a great idea of hiding a practical but not pretty blind. Thanks so much for sharing. Wow you did a great job on them! Very creative indeed! Stopping by form All Thingz Related. I love your solution, it looks wonderful ! I love this look. It all goes together so well and still looks nice and airy! I like your crazy-lady ways. We need sun blocker shades, too. I like your sneaky bamboo cover. How clever are you! Love the new look. And I’m also a big fan of white curtains. I may have to visit Ikea soon myself. Love the idea ~ Gorgeous window treatments. Thank you for sharing. I have the same curtains and same thin, black rod in almost every room of my house. What I don’t have is the great looking blinds or a way to block out the sun, which is a problem in the summer when you live in the SF Bay Area where no one has air conditioning! Thank you! I love the way all of this looks, and it’s so functional! I have roller blinds in our bedroom, but adore the look of the bamboo blinds. You are a clever girl! These look fantastic and gives the look, but keeps that practical blackout blind. Great job! Brilliant and so pretty and crisp looking! this is brilliant! I have been pondering on how to get a similar look. love it. Beautiful! I am using the ikea curtains in my front room, but haven’t been able to find a cute slim rod. Where did you find yours?!! Hi Sarah. I’m not certain where you are based though I bought my rod and acorn finials from Spotlight (Australia). The finials are not metal though because they sit high up on the wall, and aren’t viewed closely, you really can’t tell that they are just plastic. Kristine. Thanks for the inspiration! I already had roller blinds installed, so added the ikea curtains, flatstick bamboo blind (in a darker color) mounted directly to the wall, and an 8-foot stick of bamboo ($2 at a garden store) as a curtain rod that I painted and put on my existing brackets. The whole project was inexpensive and SO beautiful!! Thanks!! Sounds awesome Shannon! 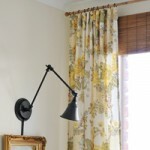 I love the use of bamboo poles for curtain rods. I recently used one in my daughter’s room. They add such a lovely organic feel to curtains. How clever are you! I love the whole whispy white semi-sheer curtain thing (I currently use Rachel Ashwell’s dotted sheer cotton drapes from Target) on a window and have been toying with adding bamboo shades (I have several swatches of bamboo blinds that I have been considering) because I felt the window and room needed more texture and interest. Your solution is absolutely perfect. The only reason I can’t copy you is that I have several cats, all with claws that I will not have removed. These cats would poke holes in the shades when down and before you know, the blaring hot sun would be shining right through them. The cats destroyed my honeycomb shades (climbed them, created holes, then chewed off the strings). I am considering shutters now. I am curious to know what this would look like when the roller shade is pulled down though? Ours is pulled down for a couple of hours every day due to the very hot western sun, and it is in our kitchen. Do you have any other pictures you could share with it pulled down? Well, it just looks like there is a plain, flat screen behind the valance. I’ll try and take a pic later today and email it over to you. 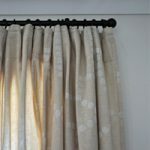 I have a large window with a white roller shade and would love to try this with the bamboo valance. 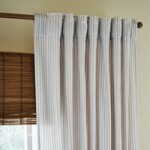 How did you drape the bamboo valance over the bracket in the middle of the curtain rod? I can’t tell how big your window is; maybe you don’t have a bracket in the middle to support it? My window is 180cm/6′ wide and I don’t have a central bracket. I guess you could simply use two separate blinds and add some kind of strap/ribbon to disguise where they meet? Or simply leave the gap as though you have two separate shades? 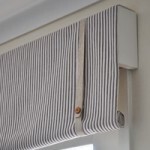 Another option would be to attach the blind to a length of wood rather than have it drape over a rod. I did this at my parent’s house where they have a very large window. I simply added a length of wood above the window frame which protruded beyond the roller blind then nailed the blind directly to it. I actually couldn’t get an off-the-shelf matchstick shade which was long enough so I used two smaller ones instead. Like I mentioned above, to disguise where the shades meet I plan to add some kind of strap (maybe a leather belt?) though I haven’t gotten around to that yet. What you do with your parents valance!